Hand framing our fences increases the style options to whatever your imagination can come up with. 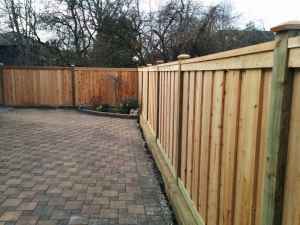 We use some of the best western red cedar which is the ideal wood for fencing, not only because of the beauty and ease of use, but because of the natural oils the wood contains that helps to prevent the wood from rotting and giving you a longer lasting fence. Hand framing our fences increases the style options to whatever your imagination can come up with. It also lets us traverse terrain that wouldn't be possible with a standard wood fence panel. Oftentimes, slope and tree lines prevent a perfect 8 foot panel from being installed. 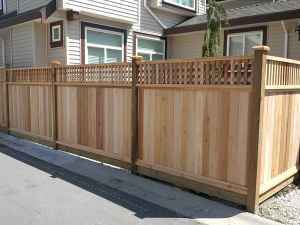 We hand build all of our fencing on site from rough cut cedar lumber and use hot-dipped galvanized and ACQ fasteners to secure everything. 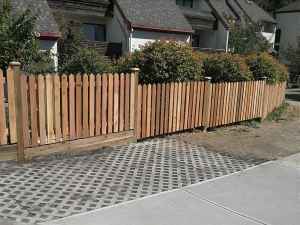 All of our fence panels are built with a pressure treated 2x6 kick board to increase strength and eliminate sagging. We also use full 4x4 treated posts to minimize twisting and increase the life of the post and fence. Hand building a wood fence does cost a little more than prefab fence panels but because they tend to be fastened together with staples and non-galvanized fasteners, building on site allows us a level of quality control than cannot be matched with pre-fab panels.